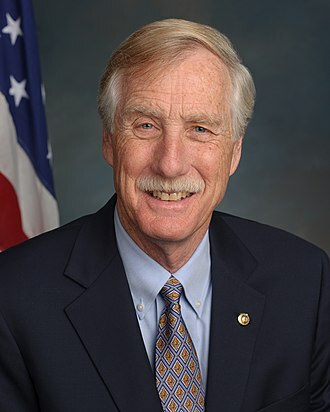 Birth Name: Angus Stanley King, Jr.
Place of Birth: Alexandria, Virginia, U.S.
Angus King is an American politician. An Independent, he has served as a U.S. Senator from Maine, since January 3, 2013. He was previously Governor of Maine, from January 5, 1995 to January 8, 2003. He is married to Mary Herman, with whom he has five children. Angus’s paternal grandfather was William Martin King, Jr. (the son of William Martin King and Caroline Elizabeth House). Angus’s paternal grandmother was Bessie Harrison Watkins (the daughter of James Harrison Watkins and Ida Louise Steers). Ida was the daughter of Edward S. Steers and Mary Sherwood. Angus’s maternal grandfather was Edmund Fillmore Ticer (the son of William Milton Ticer and Johanna Wilhimea Kessler). Angus’s maternal grandmother was Catherine E. Tennison (the daughter of James Mitchel Tennison and Virginia Park).